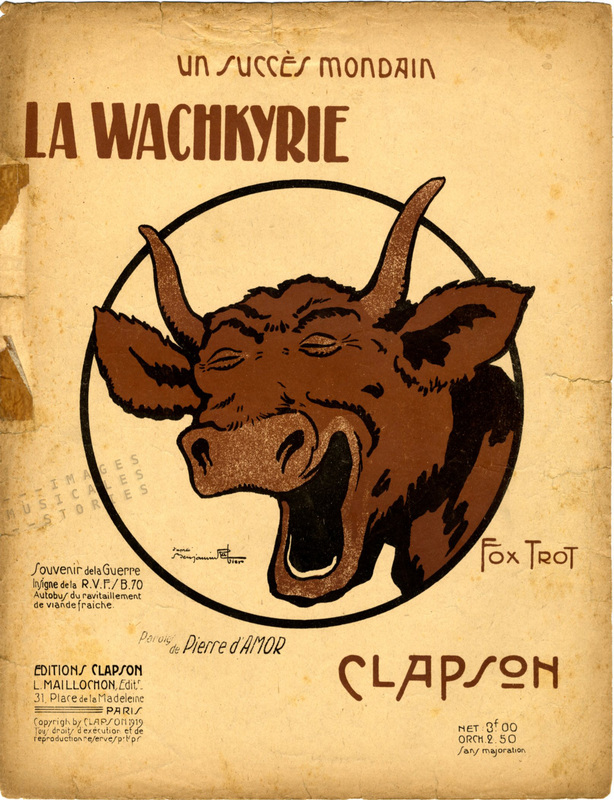 Benjamin Rabier’s drawing of a jovial cow on this cover inspired French cheesemaker Léon Bel for trademarking his cheese La vache qui rit shortly after the First World War. 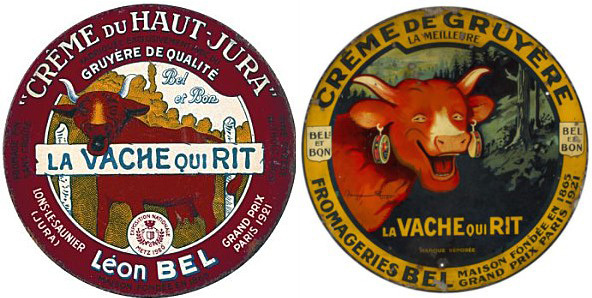 In Europe La vache qui rit (the laughing cow) was and still is a popular brand of industrial soft, molten cheese. Benjamin Rabier (1864-1939) is an illustrator and comic book artist, famous for his animal caricatures. He originally drew the head of the laughing cow as an insignia for the Service Automobile of the French army (see our previous post WWI insignia decorating sheet music for other examples). 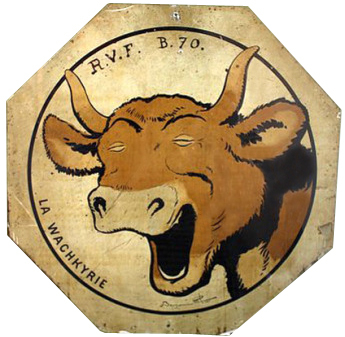 The laughing cow, nicknamed La Wachkyrie, was painted on the sides of trucks and converted buses of the RVF B.70 section. That section was part of the massive Ravitaillement en Viande Fraîche, in order to supply fresh meat to the troops near the war front at Verdun. 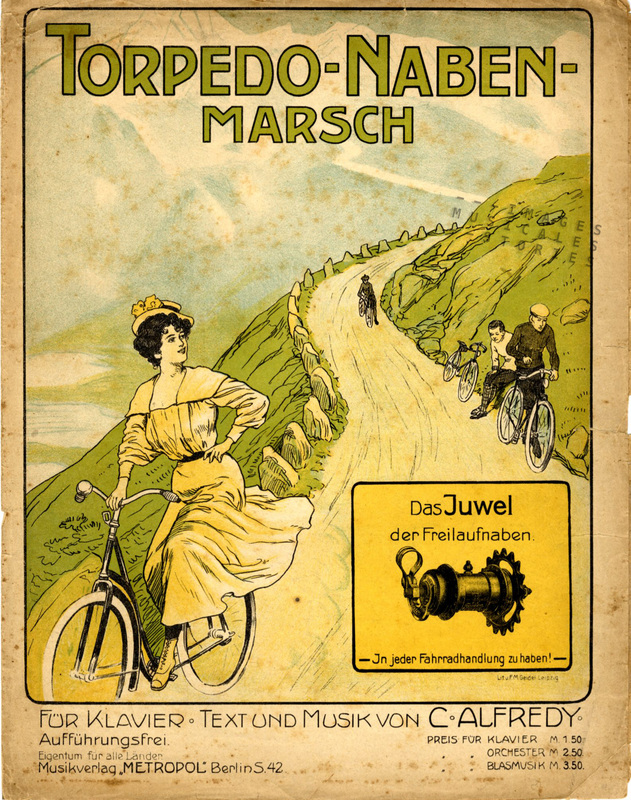 It was later, when Clapson published his song in 1919, that Rabier’s drawing appeared on it’s cover. The nickname La Wachkyrie, which reads in French as la vache qui rit, intended to poke fun at the Germans’ mythical Valkyries of Norse legend who were supposed to lead the German warriors to victory. Parisian bus from section RVF B70 with the Wachkyrie painted on the canvas. 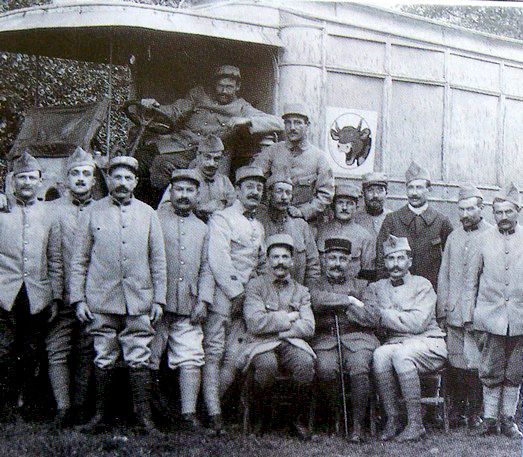 Léon Bel himself had served in the RVF B.70 section. And just like every other soldier of this section he had received a free copy of the song La Wachkyrie from the publisher Clapson. Maybe having the sheet music at home triggered Léon Bel’s idea to use the same name and illustration to launch his new brand of molten cheese. Léon Bel’s first attempt at drawing a laughing cow himself was not very successful. It shows an uninspired, rather bored-looking cow behind a fence. 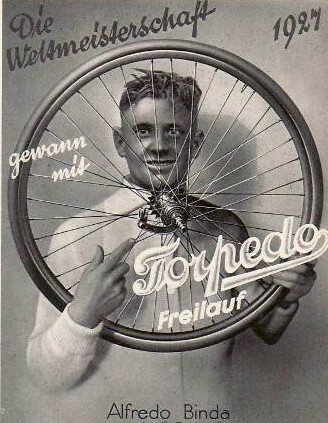 Luckily Léon Bel contacted Benjamin Rabier to fine-tune the logo. He succeeded in creating a more cheerful, very feminine red cow wearing cheese box earrings. 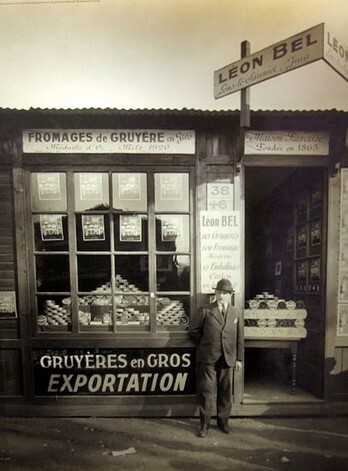 On the left, the cheese box as originally illustrated by Léon Bel. Right, the complete design makeover by Benjamin Rabier. Some time later Bel wrapped the round cheese in 8 individual small triangle portions and a success story was born. 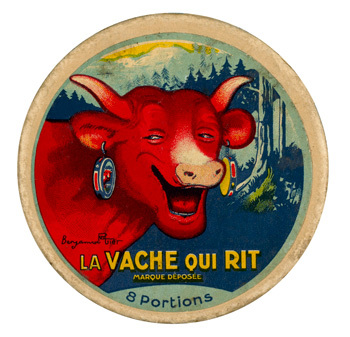 And now here is the true reason for this post: 77 seconds of the French spoken 1950 commercial for La Vache qui rit and the cook’s astonishing imitation of a laughing cow! 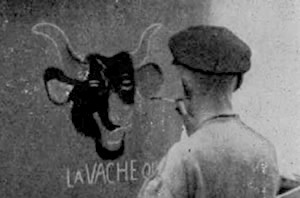 Ironically and by accident, the drawing of La Vache qui rit was used in the Second World War as the insignia for a German U-boat. The story goes like this. The German submarine ace Günther Prien was killed in action in 1941. 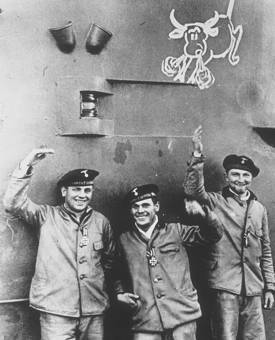 To commemorate him Jost Metzler, another captain, instructed his crew to use the same insignia as that of the late captain Prien’s U-boat. Unfortunately he forgot to add a sketch of that insignia, that is to say a snorting bull. At the submarine base in Lorient in Brittany, a crew member copied the first drawing of a cow he could lay his hands on: a package of popular French cheese. Our occasional artist copied it with such a German gründlichkeit that he even transcribed the words La vache qui rit on the submarine’s hull. A crew member painting La Vache qui rit on the U-69. This artistic faux pas led to great amusement and ridicule. 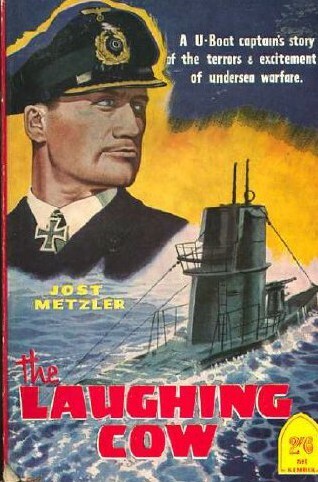 While captain Prien was nicknamed The Bull of Scapa Flow, Captain Metzler became known as The Laughing Cow of Lorient. 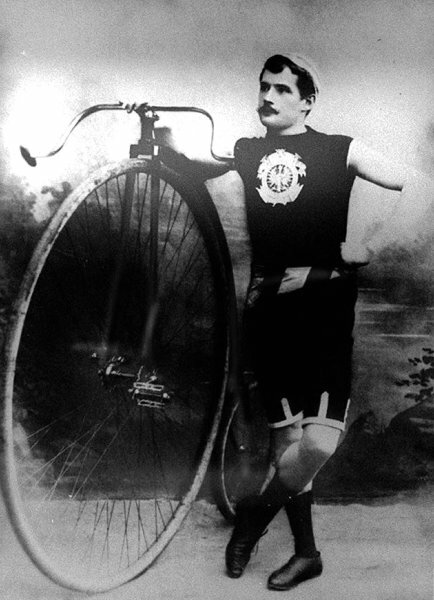 But Captain Metzler, clearly not a narrow-minded man, saw the fun of it all. And when he wrote his memoirs in 1954 he titled his book Die Lachende Kuh, or The Laughing Cow. Thomson’s Plum Pudding Model of the atom 1904. 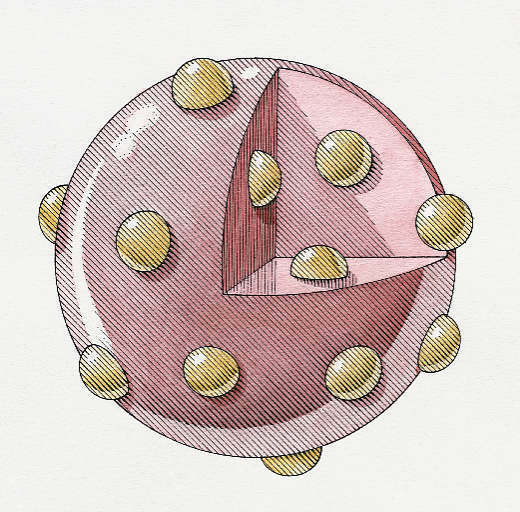 There is a very remote possibility that the illustrator was inspired by the then newly-proposed Plum Pudding Model of the atom by J. J. Thomson. Thomson discovered the electron in 1897. He initially called these mysterious particles corpuscles. 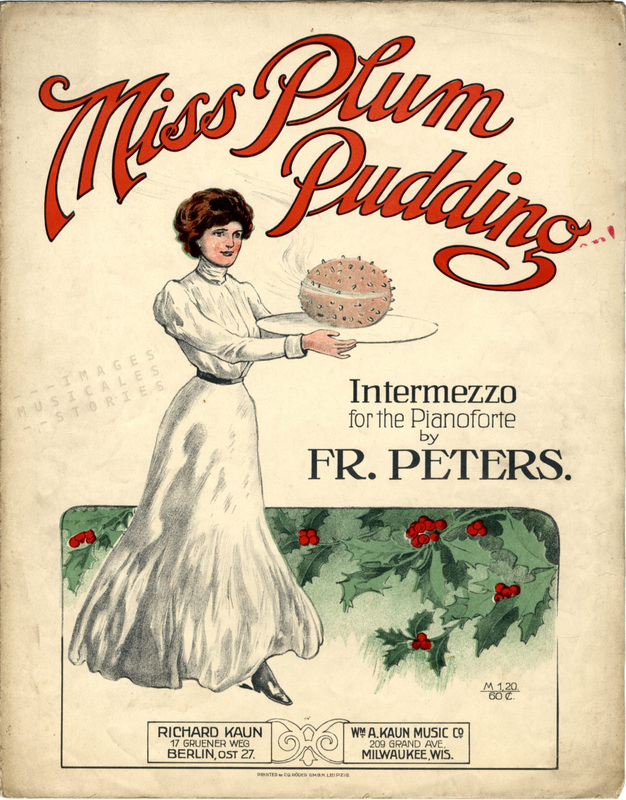 In 1904 Thomson, an Englishman suggested that electrons are components of an atom and proposed his Plum Pudding Model: a collection of negatively charged plums (an old word for raisins) immersed in a positively-charged soup, or pudding. This model was discarded and followed by the Rutherford model (1909) and by the Rutherford-Bohr model (1913).